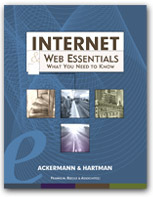 This material has been prepared to accompany the book "Internet and Web Essentials" ISBN 1-887902-40-6, by Ernest Ackermann and Karen Hartman, and published by Franklin, Beedle and Associates, Incorporated, Wilsonville OR, ©2000. No part of this may be reproduced, stored in a retrieval system, or transcribed without permission of the publisher. Feel free to browse this Web site. Please write to Ernie or Karen to let us know if you make a link to this site. - "This document describes how to use the Windows software program WS_FTP to transfer a file to and from your local computer to a University at Albany mainframe." Another excellent tutorial from University of Albany Libraries. - "This document is designed for user new, or relatively new, to transferring files using File Transfer Protocol (FTP). It is also intended for users inexperienced with installing and configuring an application for Microsoft Windows." - A collection of step-by-step tutorials for using WS_FTP PRO ($) and WS_FTP LE (freeware).